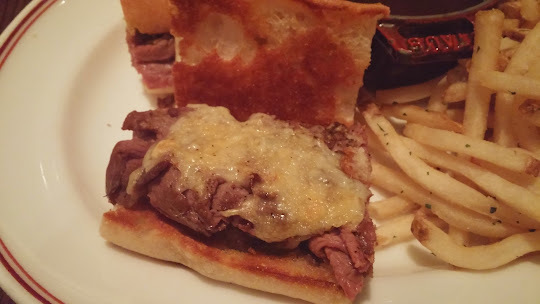 Editor's note: Scott enjoys a tasty French Dip with Gruyere cheese in Boston. After consuming three dozen oysters and a couple bowls of clam chowder in Boston within 24 hours, I needed a change. Though Boston is known for its seafood, I knew there just had to be a great French Dip in town as well. After all, Boston's got pretty much everything. So, right near Fenway Park, I found Eastern Standard - an upscale cocktail bar and kitchen with decent prices, and a vibrant but comfortable dining room and bar. "And of course, the most important criteria for selecting a restaurant - having a French Dip on the menu." 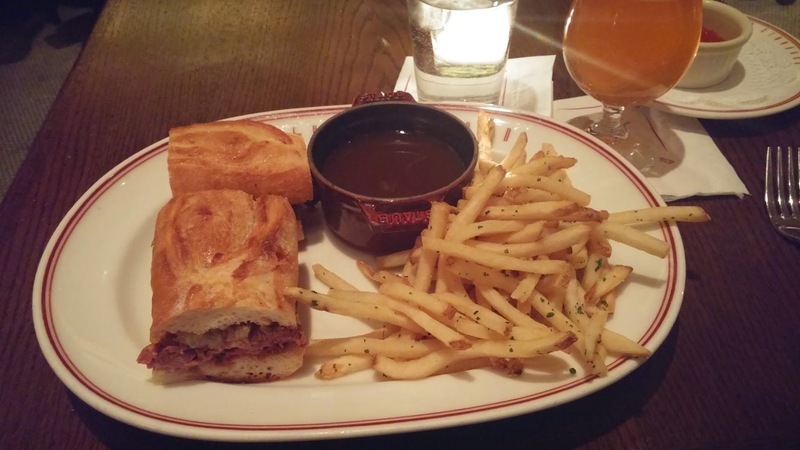 Eastern Standard's French Dip is well-priced at $12, and comes with melted Gruyere cheese. It was presented very nicely, with the au jus in a large piping hot ceramic bowl reminiscent of a French onion soup bowl (I thought that there had to be a fancy word for that bowl and really wanted to use it, but Google told me that it's just called a "French onion soup bowl" - oh well, I tried). The fries that accompanied it were garnished with parsley and herbs, and the sandwich itself, though maybe a wee bit on the small side, looked delicious. All the bread at Eastern Standard is baked fresh daily. Even the bread given to you at the beginning of your meal changes on a daily basis (the starter bread for the evening was a delicious sourdough). The French bread for the sandwich was just the right consistency of softness on the inside and crust on the outside. The meat was cooked medium, which I liked. Though there was an adequate portion, it certainly wasn't a plentiful portion. The melty Gruyere cheese, which is one of my favorite cheeses, made up for that. The first bite wasn't as good as I'd hoped it would be, but that would change with the second. The only real negative point was the au jus. 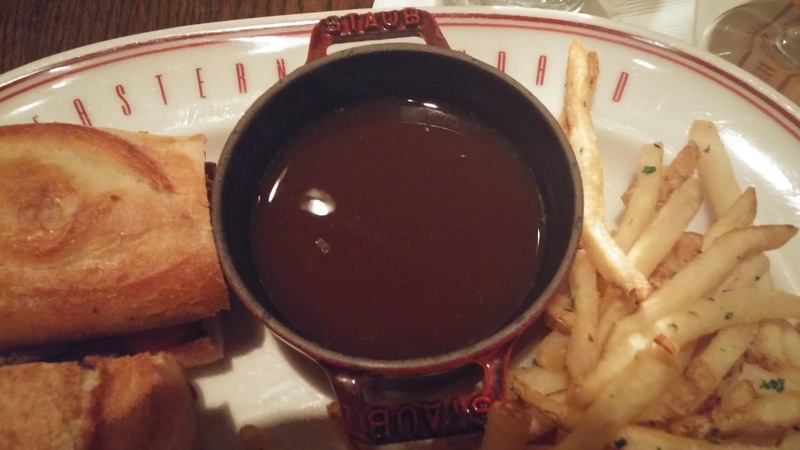 But, the only thing wrong with the au jus was the lack of salt. I mean, there was seriously no salt in it at all. I'm not usually a salt fiend (with the exception of the rim of a margarita), but this was severely lacking in salt. The nice thing about something not being salty enough is that you can just add some salt to it. You have to keep in mind that you can always add it, but you cannot take it away. So an err on the side of not being salty enough is at least an err in the better direction. After a few dashes of salt and quick swirl, the au jus came to life, and was strong in beef flavor, but not in density (a good thing in my book). I realized when stirring it around that it was nearly opaque - with tiny bits of beef that had been deglazed floating around - just giving it an excellent, rich flavor. The second bite (and every subsequent one), after a bit of salt, was what I was looking for. Eastern Standard doesn't have the best French Dip I've ever had by far, but it's still one of the better ones that I've had the opportunity of enjoying. The restaurant itself is great, the waitstaff is exceptional, and I thoroughly enjoyed my meal.